When would I want to use IMAP over POP3? 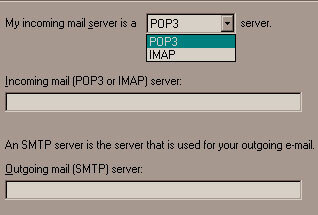 How is IMAP different from POP3? How do I set up Outlook to access the server? Coastline now offers IMAP e-mail, which allows you to access your mail and store it directly on our server. All accounts default to 5MB of space, so it is very important to clear your messages often. POP3 mail is downloaded to your local computer. It is an excellent solution for a user who is the only one to access a mailbox and doesn't plan to travel soon. It clears out your e-mail and frees you up to access large attachments. No, not all accounts have IMAP available. Only accounts set up or transferred to our newest server can use IMAP. If you have IMAP it would be specified in your Welcome e-mail that contains all of your default settings. When you are creating your account, Outlook will prompt you for your incoming server. Just click on the drop down menu and change from the POP3 default to the IMAP server. What are the drawbacks of IMAP? Your box could easily fill up and then your mail would be returned to the sender as undeliverable. POP3 is definitely the better e-mail choice if you are in the office and have one person who needs to access the mailbox. Also, deleted items are actually deleted. With a standard POP3 box you have the option of keeping your deleted items stored indefinitely. With IMAP, all e-mail stored in folders adds to your 5MB limit.